Are you looking to make an addition to your Kansas City home that will be useful and provide a great return on your investment? Look no further than sunrooms. These bonus rooms really are a bonus to any home. If you’re on the fence on whether or not to install one, let Blue Springs Siding & Windows explain to you five reasons why adding one to your home will benefit you now and later. Contrary to some beliefs, sunrooms are not only for use in summer months, but all year round. The materials we choose to install with our Crown Sunrooms are top of the line, and help ensure you’re able to enjoy your extra living space any time of the year. Many of our sunrooms come with interchangeable screen and glass panels, allowing you to customize your sunroom for each season and what is most comfortable to you. Want to start enjoying your yard all year long? Install a sunroom with Blue Springs Siding & Windows. Adding a sunroom to your home not only allows you to enjoy the benefits of the fresh outdoors while still being shaded from the heat, but it also adds more light to your home. Many of our sunrooms are composed mostly of panels that let light into your home. This added natural light is a great way to make your home appear more open and brighter. Sunrooms are also a great way to keep heating and cooling costs down. When it comes to energy efficiency, our sunrooms meet Energy Star standards, as well as standards set by the National Fenestration Rating Council (NFRC), American Architectural Manufacturers Association (AAMA), and the National Sunroom Association (NSA). Our sunrooms use energy efficient glass and materials that help keep heat gain down, and act as a buffer between the sun’s rays and the heat that normally builds up in your home. This keeps your cooling bills down in the summer. In the winter, a sunroom also acts as a buffer by decreasing the amount of cold air leakage that seeps into your home. Adding value to your home is always a plus, and sunrooms can help you accomplish that. Installing a sunroom in your home adds value by adding square footage to your living space, and by increasing the enjoyment factor of your home. 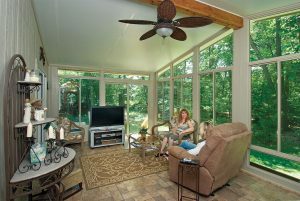 Screened in porches or sunrooms are a huge attraction to homebuyers, because they allow homeowners to enjoy the benefits of the outdoors without the harsh rays from above, the threat of rain, or the aggravation of bug bites. Sunrooms are also a great way to protect your patio furniture. Keeping your outdoor furniture covered in a sunroom keeps it away from the harsh elements, allowing it to have a longer life span. That means you won’t have to buy new patio furniture nearly as often. For more information on how Blue Springs Siding & Windows can help you start enjoying the outdoors from a sunroom, call us today at (816) 228-5225.